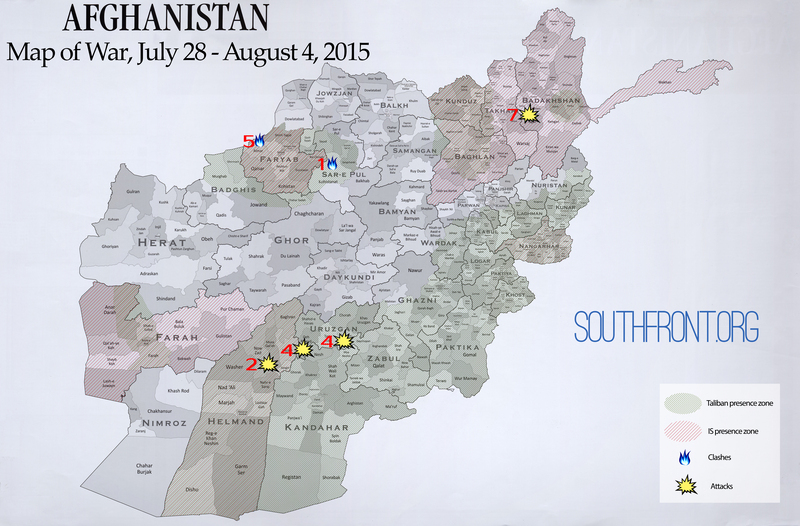 Afghanistan Map of War, July 28 – August 4, 2015 0 out of 5 based on 0 ratings. 0 user reviews. The clashes over the country were complemented by a political competition in the Taliban and the failure of a possible peace process. Last week Taliban militants seized wide areas in the northern Afghan provinces of Kunduz, Sar-i-Pul and Badakhshan. They are continuing to advance there and in the country’s north despite the death of Taliban’s head Mullah Omar. The Afghan Security forces (ASF) show signs of low morale, some servicemen have already defected to the terrorist. July 28, The Taliban continues to press its offensive on multiple fronts in the Afghan north, taking control of the Kohistanat district in the once calm province of Sar-i-Pul after a police commander and his officers defected to the jihadist group. The Taliban took control of Kohistanat after launching an offensive on July 26. The fall of the northern district was confirmed by all sides of the conflict. Moreover, a local police commander and his officers defected to the Taliban at the beginning of the fight. An “Afghan Local Police [ALP] officer together with seven of his men joined [the] Taliban,” Khaama Press reported. Sar-i-Pul province is a well-known stronghold for the Taliban and the allied Islamic Movement of Uzbekistan (IMU) linked to both the Taliban and al Qaeda. July 28-29, The Taliban overran the district Now Zad in the southern Afghan province of Helmand. The Taliban claimed it launched “a coordinated assault on enemy positions around Now Zad district center” on July 28. Six “check posts” were overrun on the first day, and the jihadist group said it killed 25 security personnel. The next day, the Taliban claimed that “Mujahideen managed to overrun the PRT [provincial reconstruction team] building along with 2 more check points overnight, killing 14 hireling troops” and seized weapons, ammunition, vehicles, and other equipment. The Taliban reports ASF withdrew from the district after the jihadist group massed for an assault. The fall of Now Zad was confirmed by Afghan officials. The near-by districts of Kajaki and Musa Qal’ah are already under the Taliban direct control. July 31, The Taliban has announced the confirmation of leader Mullah Omar’s death. A new emir and two deputy emirs have been chosen to lead the organization following it. The Taliban’s new emir is Mullah Akhtar Mohammad Mansour. Mansour previously served as the minister of civil aviation and transportation during the Taliban’s rule from 1996 to 2001 and as the group’s shadow governor for the Kandahar province. The family of Mullah Omar doesn’t support the new emir. Furthermore, anti-government group “Mahaz Fedai” has already accused Mansour in death of Mullah Omar. According to its statement Omar was poisoned by someone from his inner circle. August 1, Two militants opened fire inside Yakori Ghwandi checkpoint in the Deh Rawud district of the Uruzgan province, killing commander Mir Wali along with 4 policemen. One more checkpoint was attacked in the Chinartu district. There is no confirmed information about causalities there. August 2, Taliban militants have been clashing with the Afghan National Army in the Faryab province. Taliban reports that “Khwaja Zata Khan region – a large area consisting of around 12 villages – has been cleared from enemy presence”. However, clashes are still reportedly taking place in the фrea. August 3, Syed Mohammad Tayab Agha, the head of the Taliban’s office in Qatar and a very close ally of the late leader stated on Monday that he had resigned, citing internal factional struggles to seize control of the leadership. “In the current controversial situation, I am not supporting any side,” Tayab Agha said in a statement. August 4, Taliban militants launched a new offensive in the Tagab district of the Badakhshan province. ASF were forced to out of Khorak and Do Aabi areas. An ASF’s APC was blown apart with an IED close to Khunbak Aab bridge, injuring 4 servicemen onboard. The fall of Kohistanat and Now Zad is the latest in a string of Taliban victories in the Afghan. Late last week, the jihadist group overran a base and several outposts in the Warduj district in Badakhshan and established direct Taliban control there. In Kunduz province, the Taliban controls at least three districts and three more are said to be heavily contested. Day-to-day Taliban gains new territories without any effective resistance from the ASF. Thus, announced by Kabul anti-Taliban operation in the north has almost failed. Mullah Akhtar Mohammad Mansour became the new leader of Taliban, but not all members of the Islamic extremist group appeared to support that move. Factions supporting Mullah Omar’s relatives claimed that Mullah Mansour had seized the leadership. A split in the group following Mullah Omar’s death probably won’t stop the militants advance, but could undermine the talks with Afghan government. Before Mullah Omar’s death was confirmed, Taliban representatives held talks in Pakistan with Afghan government officials about a possible peace process. The Taliban’s office in Qatar was an important element in any future peace talks with the Afghan government. Now, when Tayab Agha resigned, the talks will probably be postponed indefinitely. The war has been continuing.